Ladies multi-stone and diamond ring in 18 karat yellow gold. Stamped 18k and weighs 18.1 grams. 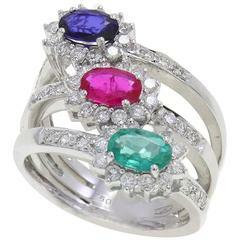 The colored stones are natural cabochon cut, 10 x 7mm blue sapphire, 8x 6mm ruby and 6.5 x 5mm emerald. On the sides are round brilliant cut diamonds, .60 total carats, G color, VS clarity, good cuts. The ring size is 7 1/2 and can be sized. High quality workmanship and in excellent condition.